Anyone reading my blog this week will have noticed a theme emerging. Now the summer has officially ended, I’m back in full roast dinner mode. There’s another motive behind this new found desire to share everything roast dinner. I’ve entered into stealth Christmas mode. It’s that time when secretly everyone’s thinking about Christmas, but it’s a bit too early because you have to get Halloween out of the way first (or is it just me?). I mentioned in my perfect roast potatoes post a couple of days ago that I’m not a huge fan of the Autumn and Winter. However, I’m a huge fan of Christmas. So, ever since Daniel started back at school and the evenings started getting darker, I’ve been thinking about Christmas. I accept that it’s actually far too early to be sharing Christmas recipes, so I’m stealthily sharing them under the disguise of roast dinners. The great thing is that they’re just as perfect for your regular Sunday roast as they will be on the big day and by sharing them now it gives you the chance to try them out a few times before the big day comes! Join the Charlotte's Lively Kitchen mailing list to hear about new recipes first. Pre-heat the oven to 220ºC/200ºC fan. 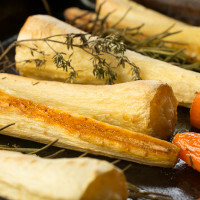 Peal the carrots and parsnips and chop the larger ones lengthways into halves/quarters so that all pieces are about 1-2cm wide. 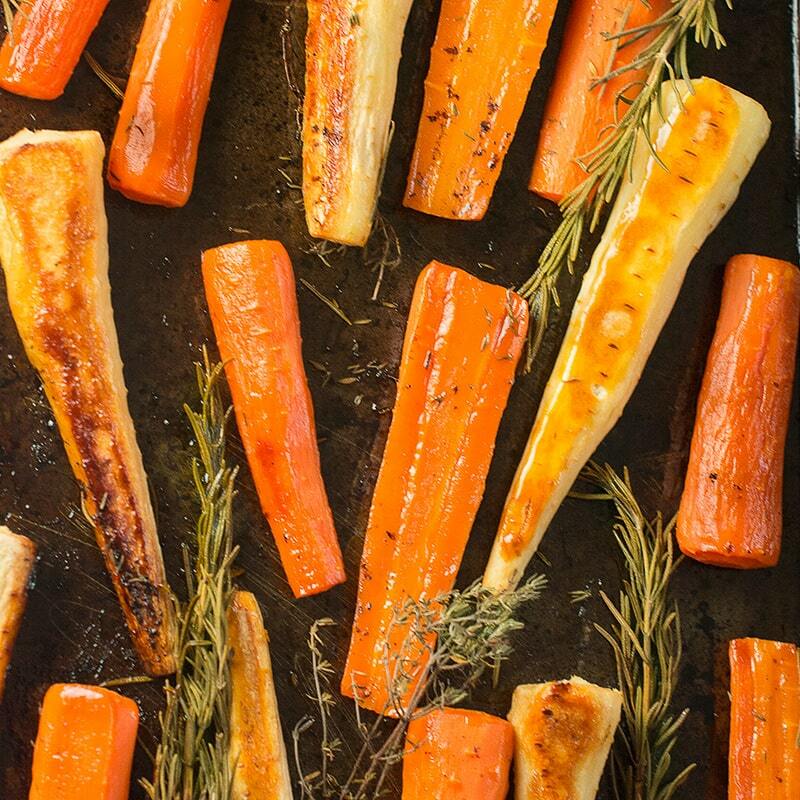 Put the carrots and parsnips into a baking tray, ensuring that they all have a bit of space. 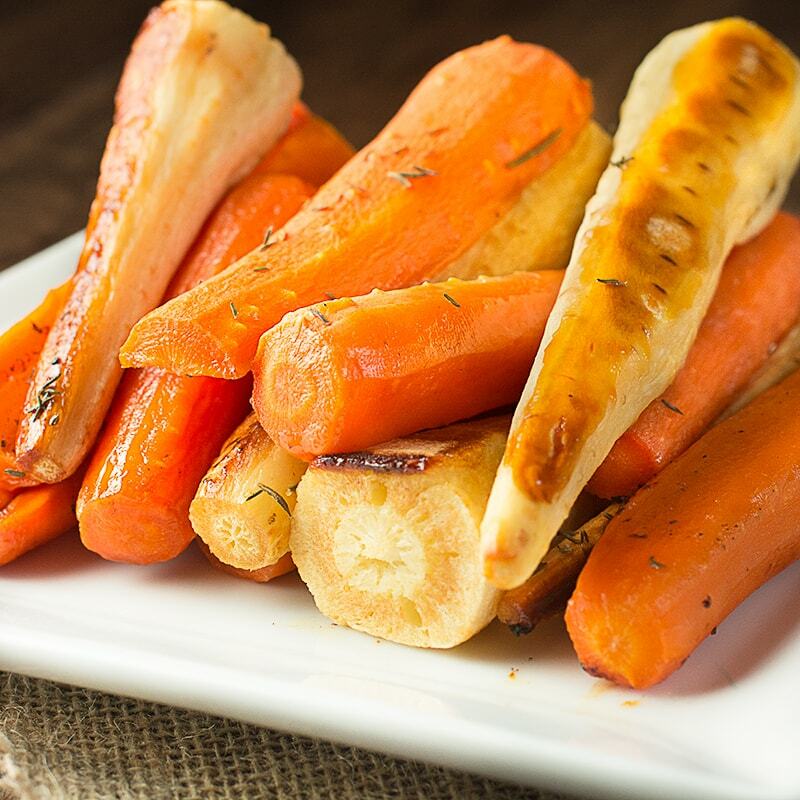 Mix the olive oil (2 tsp) and honey (2 tsp) in a cup and brush over the carrots and parsnips. Lay over the sprigs of rosemary and thyme and season with salt. 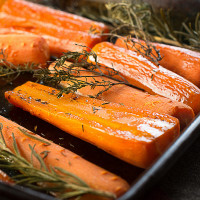 Put into the oven and roast for 35-45 minutes (until they're soft with a little bite). Give the tray a shake every now and again to help them cook evenly. Once they're cooked, they're ready to serve. Have you tried this recipe? Please leave a comment and rating at the bottom of the page to let others know what you thought. Any nutritional information shown is the estimated nutritional information per serving. Please refer to my guide to Charlotte’s Lively Kitchen nutritional information if you want to learn more about how this is calculated. The ingredients I used to make this recipe are all free from the following allergens. However, please check any labels carefully for allergens you need to avoid as brands can vary and product recipes can change over time. I’m sharing this recipe with #TastyTuesdays with Honest Mum and #RecipeOfTheWeek with A Mummy Too. Thanks for pointing out the error. It was actually 220C/200C fan as these are the most common temperature measures used here in the UK, but it was definitely wrong. I’ve fixed it now. I hope you enjjoyed the carrots and parsnips. aino you haven’t. i had to come to comments to find usa equivalents. Hi Jane, I usually provide over temperatures in C and C fan as these are what I fund are most commonly used in the UK. There was previously an error in the fan temperature which I fixed. I never usually provide F as standard, although it is something I’m considering adding in future if it would be useful. Could you use vegetable oil instead ? Yes, the work fine with any cooking oil so go with the one whose flavour you like best. Will definitely make them again. These taste lovely and came out the oven a really nice colour. 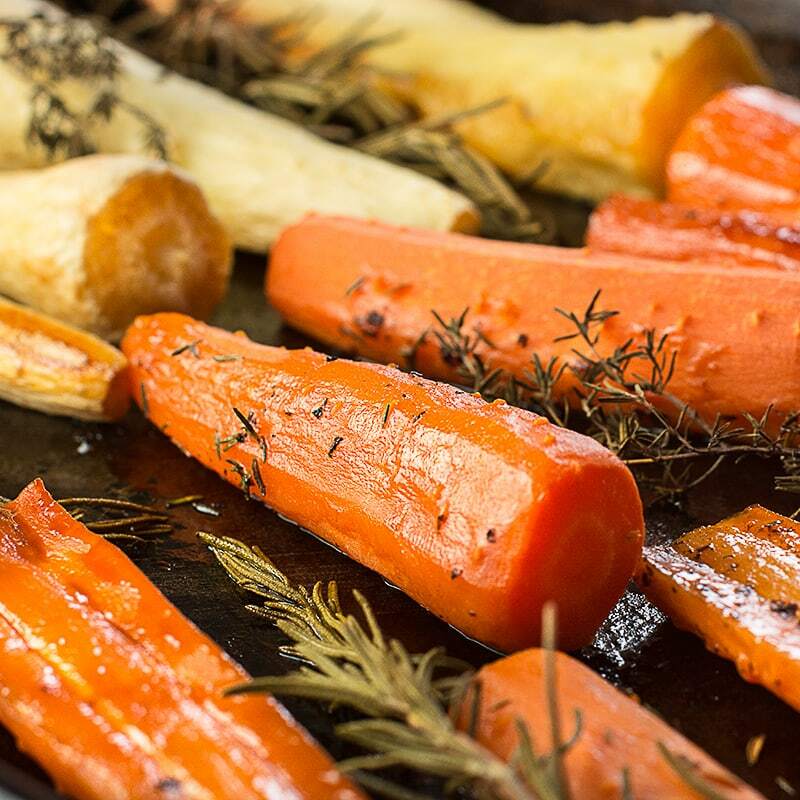 I much prefer roasted veg as they keep their flavour better than boiled. Thanks for the recipe. I prefer the flavour of roasted too.